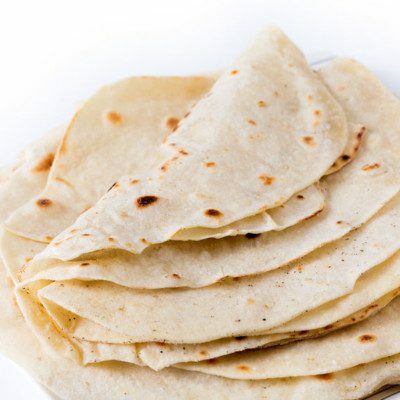 Flour tortillas are flat and circular breads used as the base for traditional Mexican foods such as tacos, burritos, quesadillas and enchiladas. They are usually eaten warm with a topping that may include cheese, meat, and a variety of spicy sauces. Flour tortillas are different from corn or masa tortillas. Flour tortillas are made from wheat flour dough that is leavened by steam generated during baking or raised lightly with a small amount of baking powder/yeast. How are flour tortillas made? All flour tortillas contain at least four basic ingredients: wheat flour, water, fat, and salt. Flour tortillas are typically 3/64″ – 5/64″ (1.0–2.0 mm) thick and have diameters of 6.0″ –12.0″ (15.0–35.0 cm). * All purpose flour can be used. ** Baking powder can be used instead of yeast (1.5–2.0% based on flour weight). *** Different types and levels can be used, depending on dough handling properties desired, machinability (rollability) and target flavor and shelf-life. Tortillas can be industrially produced by dough pressing (hot-press) and extrusion (die-cut). Each operation requires different flour specifications, dough handling properties, and baking conditions, which result in various tortilla characteristics. The dough pressing operation, a more automated procedure, involves pressing the round and proofed dough pieces in a heated, hydraulic stamping equipment. 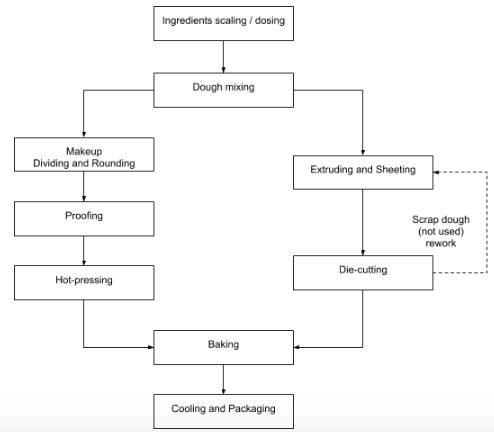 Tortilla dough is extruded in a continuous band, followed by sheeting and cross rolling to the correct thickness 1⁄2” – 2 1/2″ (0.5 – 2.5 mm) and cutting with a circular die into individual round pieces whose diameter is identical to that of the die. Block diagram of flour tortillas production (hot-press and die-cut method). Mixing. Mix to obtain proper extensibility. Mixing time of 5–12 min. The optimum dough temperature should be 89–93°F (32–34°C). Proofing. Proof for 5–20 minutes at 82–86oF (28–30°C) and a moist environment of 85% RH. Baking. Given product dimensions, tortilla disks are baked at 350–500°F (177–260°C) for 20–50 seconds, usually in direct gas-fired ovens. The higher the oven temperature, the shorter the baking time. Cooling. Product is cooled to less than 89oF (32°C) for 2–5 minutes on cooling conveyors before placing into plastic bags for distribution. For mold inhibitors, Potassium sorbate (10% solution as spray), calcium propionate, vinegar (100 grain) and sorbic acid can be used. Levels cannot exceed legal limits established by the FDA. Mold inhibitors never replace good manufacturing practices. The best way to extend shelf-life is by following strict pre-requisite programs and having a food safety management system in place. ADA (azodicarbonamide), potassium bromate, ascorbic acid, can be used to increase dough strength. Oxidizing agents reduce rollability or extensibility of dough. Serna-Saldivar, S.O. Wheat Flour and Corn Products, Cereals and Grains Association, AACC International, Inc., 2015, pp. 15–227. Rooney, L.W., and Serna-Saldivar, S.O. “Tortillas.” Encyclopedia of Food Grains, 2nd edition, Volume 3: Grain-Based Products and their Processing, Academic Press, Elsevier Ltd., 2016, pp. 90–96. Serna-Saldivar, S.O. “Manufacturing of Bakery Products.” Cereal Grains: Properties, Processing, and Nutritional Attributes, CRC Press, Taylor & Francis Group, LLC, 2010, pp. 259–311.